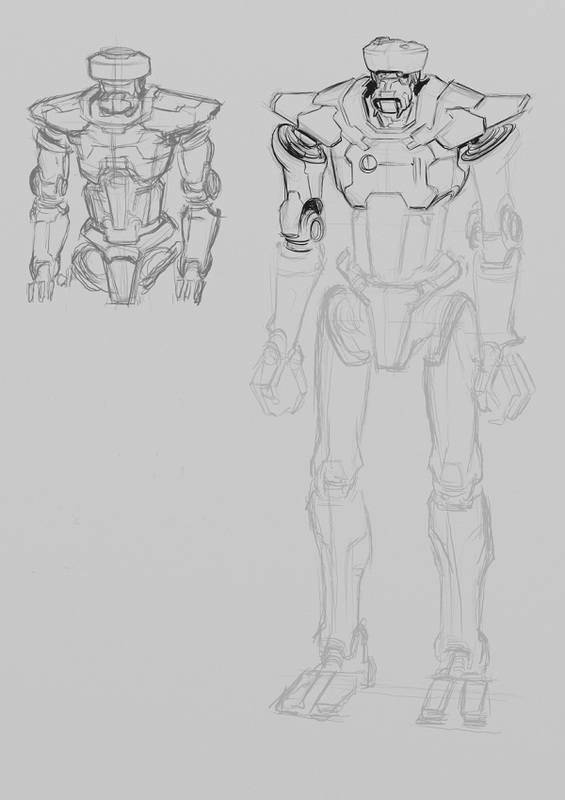 The pieces below are for a Generic Humanoid robot capable of performing many tasts in the game they can be configured for Security, Labor, Mechanical Repair duties, Housekeeping, whatever. 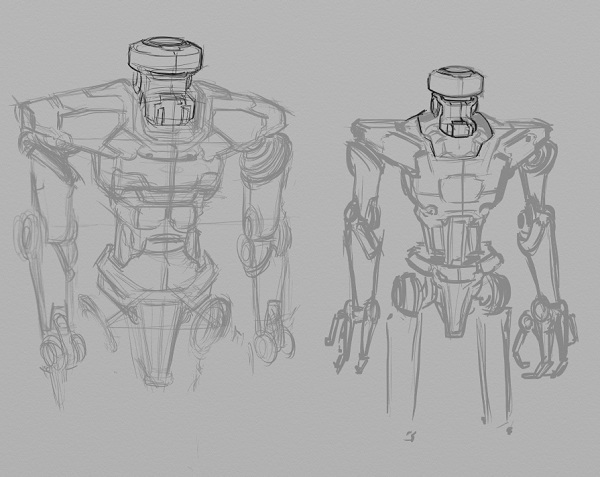 The robot needs to have an industrial design look to it and NOT look like any of the bad guys we’ve created so far. #1 Doesn’t grab me, maybe its too C-3PO or too much like the Sentient race of Robots the Kopek we’ve done already. #2 Has too much of a Cylon vibe for me, intentional or not, people would complian. #3 The Claw hands are awful, its utilitarian and reminds me a tad of MAx from Black Hole. #4 Does not grab me. #5 I love the head, shoulders, body all of it, we might see this get used someday. #6 There is no magic, I don’t like the visor and he looks like a guy in a suit. I really latch onto #3 for some reason and ask Tomi to take that design, but give me some alternatives on it, the thumbnails above were pretty loose, so he can still play with the design a little before cleaning up the lines and tightening things up overall. The first set of alternatives. Big shoulders win, but I ask Tomi to thicken up the midsection a little. We’re closing in on the arms, and shoulders, but the chest still bugs me. I wasn’t really happy with the faceplate so were tried some more things and the three lense optical sensor is born. You’ve already seen this on the Plasma Destroyer, but I’ll have to check my records to see which actual piece of artwork came first. We finally settle on an Evangelion-esque torso in the end. We have the three lens sensor, the three pointed feet, but there isn’t too much else that looks similar to the Destroyers. I know the thighs look odd, like the middle of the robot is further left than you’d expect, but Tomi assures me the curve of the left leg is just obscuring the left side hip joint. If I had it to do over, we’d move the torso over a tiny bit to the right. So in the end this is the Generic Humanoid Robot, its job is to do anything a Humanoid can do, using their tools and very little instruction. I do assume these things would be prohibitively expensive and I set my sights on some cheaper labor bots, something ridiculously cheap and compact that can be unpacked whenever needed to do something in a pinch. We’ll talk about Shoebox Humanoid Robots in the next article. 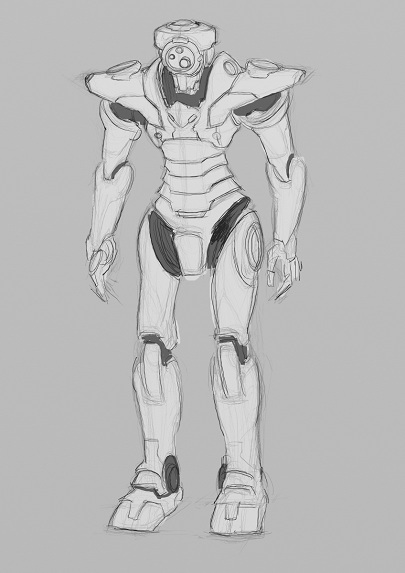 All in all I like my Generic Humanoid Robot. I hope these articles give you a better feel for thumbnails, and for making design choices to make your setting unique. 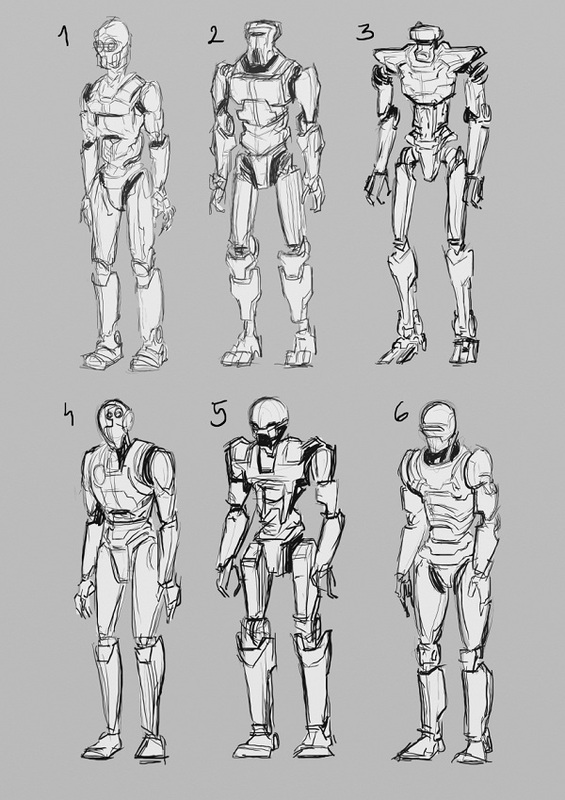 So breakdown of the Robot Drawings, all of them had concepts in mind, none of them had a specific publishable project in mind. I have since decided that all of the Robots could go into a game supplement which could be used in Galaxy Pirates, the robots will be programmable like Animals are Trainable in most D20 OGL games..
-The final images were done in black and white, none of these are done in color or rely on color, a lot of the equipment stuff is going to be in Black and White, likewise Guns and Spacesuits don’t always need color to show all of their details. Certain thing like Grenades will be in color.